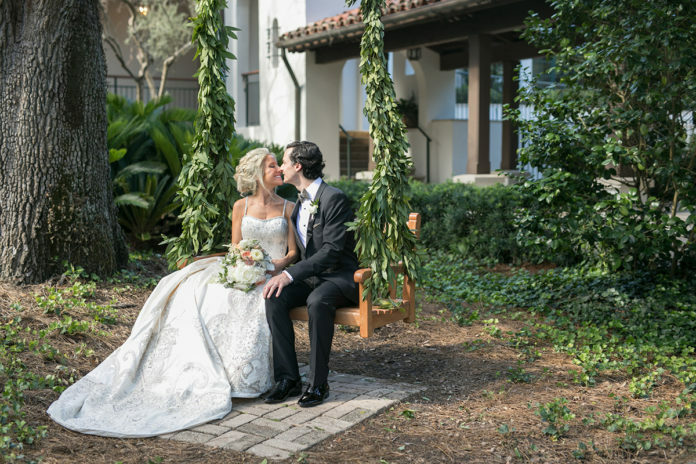 At Sea Island, a swing decorated with fresh foliage created a magical photo setting. 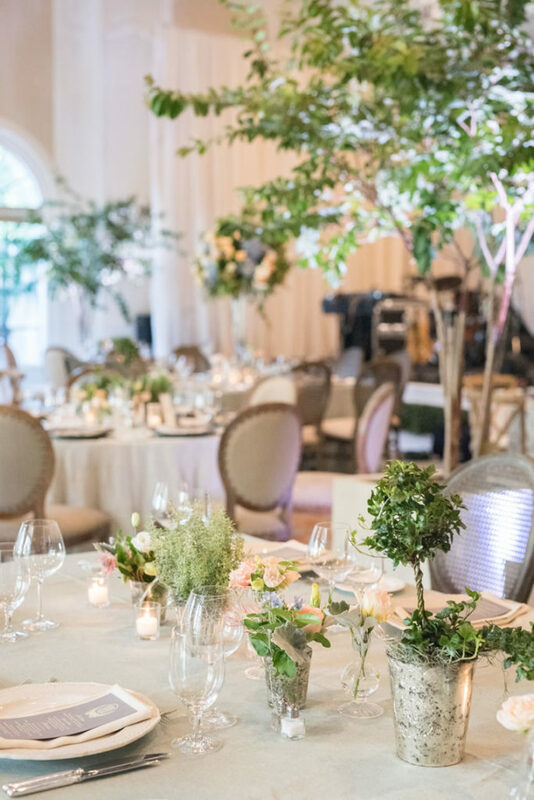 From the smallest details to grand installations, greenery is bringing a natural look to weddings. Lush, voluminous foliage and flowers hugged the steps and archways of St. George’s Chapel, where Prince Harry and Meghan Markle exchanged wedding vows last year. As the world watched the nuptials, engaged couples took notice—and the use of greenery for weddings continues to grow. 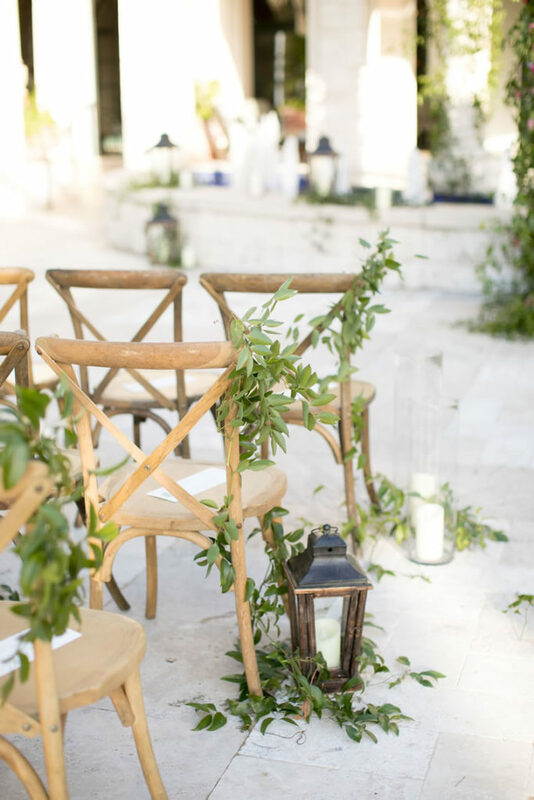 Now known as the “go-to shade” for wedding décor, greenery such as freshly cut ferns, winding vines and pungent herbs are frequently adorning churches and wedding reception venues. 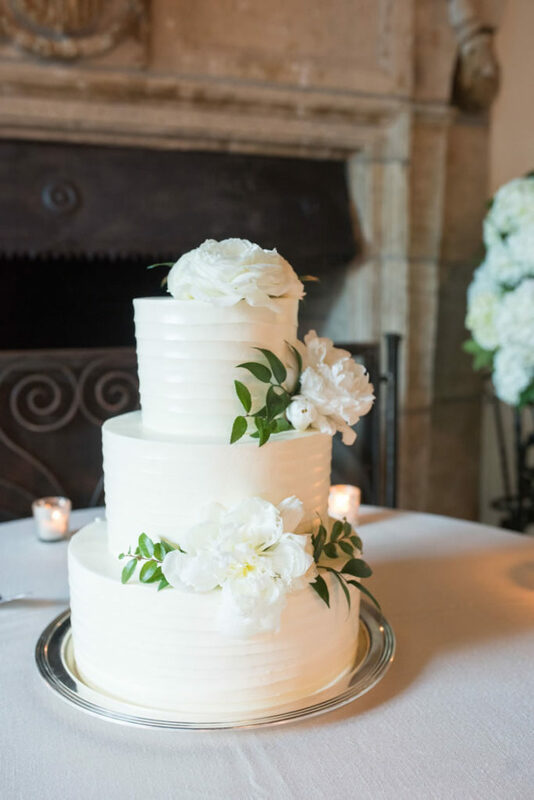 For the wedding ceremony, couples are covering welcome signs with garlands, lining aisles with stems of olive branches, hanging wooden lanterns filled with mixed greens and even using garlands to line entranceways. At the reception, doorways are often trimmed with green swabs and centerpieces are stuffed with fresh herbs. Dance floors are surrounded by potted plants and chandeliers are made exclusively of vines. Fresh standalone features are popular alternatives to the ice sculptures and golden trellises of yesterday. “2019 will redefine modern elegance, bringing in more greenery in a variety of shades and texture,” Wyndrum says. Using greenery offers a deeply personal touch—think bright herbs that are reminiscent of grandma’s kitchen; plants and trees that are native to a favorite vacation locale; and winding vines that once draped across a childhood fence. In large event spaces, greenery works well with tall ceilings. Statement arrangements within the room fill the empty space and long branches of leafy greens in tall vases help to break up the emptiness overhead. Pops of color draw attention to the arrangements around the room. Living bars can take on many shapes and sizes, with some couples and designers using greenery to cover the façade of the bar. Others grow greenery through a lattice that is set behind the bar or install a climbing rose garden behind the bar. While greenery remains a go-to around candle centerpieces, it also is becoming popular in smaller ways. 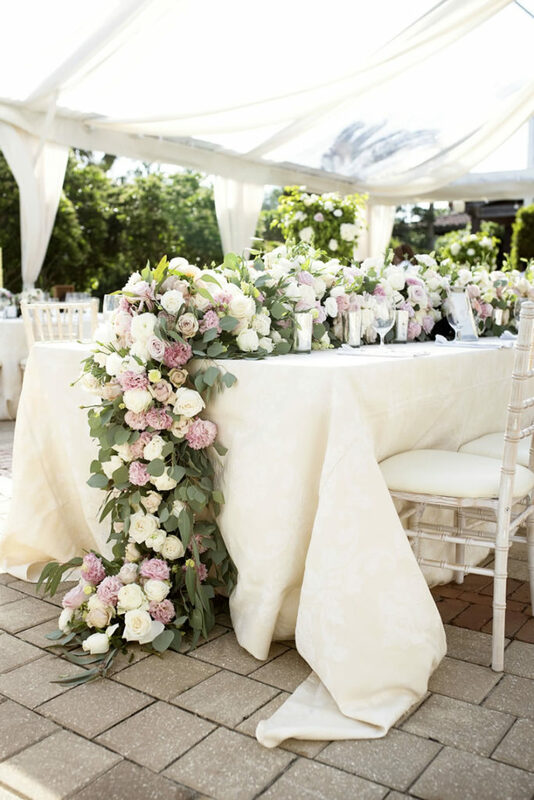 Potted plants—reminiscent of a family garden—are often placed down the ceremony aisle, and natural elements, such as potted herbs and fresh ferns, are a popular choice for tables. The design can be highly individualized; for example, a single leaf can be placed on each cloth napkin. Wedding greenery isn’t the only way that brides are highlighting a natural look—makeup is also trending toward the organic. “Brides want to look back at their wedding pictures and recognize the woman they see there,” says Margina Dennis, a makeup artist whose work has appeared in publications around the country. Not surprisingly, the royal wedding also helped to influence this trend. “Minimal makeup has been big in the fashion world for a few seasons now, but I think when Meghan Markle married Prince Harry and looked like herself, it made a big push in this direction for trends for brides,” Dennis says.